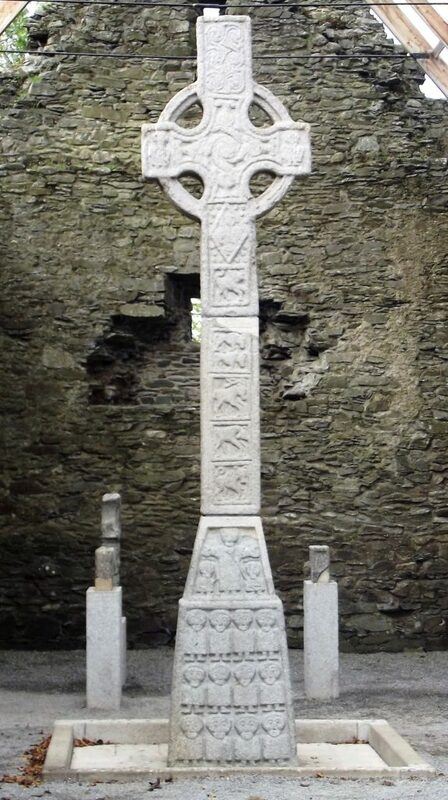 The Moone High Cross is the second tallest high cross in Ireland and it is said to be one of the best examples in the country. It is divided into three parts, the upper, middle and base. In 1893 the middle part was discovered and reunited with the remaining parts which were originally found in the ruins of the medieval church in 1835. Today, the complete cross stands at 17.5 feet (5.3 meters). There are different scenes depicted on the cross; Daniel in the lions pit, the three children in the fiery furnace and the miracle of the loaves and fishes amongst them. The monastery is believed to have been founded by St. Palladius in the 5th century, dedicated to St. Columcille in the 6th and the cross, constructed from granite, is reputed to date from the 8th century. Take N9 South for Carlow & follow signs for Moone. Drive through Moone Village turning right at the sign for the High Cross. OSI Discovery OS. Map: 55 S 789 927.